The Plaza Hotel on Station Road, Jalgoan was so clean I felt I could have eaten my dinner off the bedroom floor. In India that's really saying something. The manager explained that they are Jain people so cleanliness is very important to them. I silently wished that the Jain faith was more popular. Within five minutes of my checking in to the little oasis of spotlessness, complete with BBC news, HBO and a mossie screen, the manager had told me the best places to eat both veg and non veg, where to get a beer and a choice between a GP and an Ear Nose and Throat doctor. Not be melodramatic I took the GP's address and proceed directly to the smoky bar the manager had directed me to for a special veg club sandwich, finger fries and a Kingfisher. Thankfully I got what I was hoping for – a decent sandwich, chips and a beer. If you want to stay at the hotel, and I highly recommend it you cn contact them on [email protected]. After a fitful bite free slumber I had a banana for breakfast on the way to the Raisoni hospital. My ear was now quite sore so I was hoping for as decisive a treatment as I had received in Cambodia. At least I could hear though. Jalgoan is a pleasant town with a country town bustling atmosphere but which gets the odd tourist passing through. After a short wait in a room filled with catheter holding patients (seem to need a lot of those in India) Dr. Shekar Raisoni MS, FICS (USA), FAIS listened to me from behind his desk littered with papers and boxes of tablets. I gave him my ears' potted history, including the incident in Mumbai and, putting a fresh battery in his instrument, had a look. Reassuredly he said he should be able to solve the problem. Just some light cleaning and some antibiotics. Which he could do now. Just needed to prepare the treatment room. No problem. He wrote me out a prescription and when I asked how much he said 500Rps for the consultation and same again for the treatment. 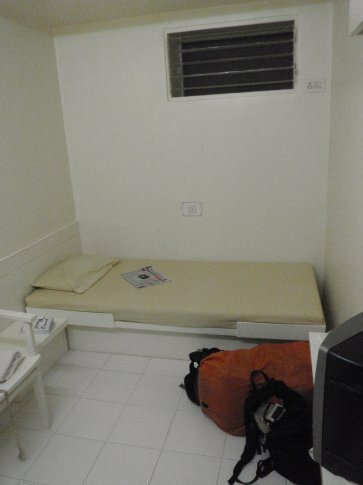 12 quid, a far cry from the more than 200 the Angkor Royal Hospital charged. A few minutes later I was lead to an operating theatre with lots of machinery from the 50's. I lay down on the bed and to my great surprise, had a heart rate monitor attached to my toe. I had been expecting some short of suction device, like last time but the doctor had some cotton wool attached to a skinny plyers. He gently placed it in my ear and swabbed and started to go further in. My heart rate increased as I realised that this was not going to solve the problem. Just as I had that premonition I felt the thing in my ear be pushed further in. I could feel the passage literally block up and my hearing stop. I told the doctor what had happened and said “No no look I am cleaning it” – pointing at the swab marked with a little waxy stuff that paled into insignificance in comparison with what felt like a blob of blue tack far into my ear. The beeping continued to increase in pace. He peered into my ear and said “Maybe right”, mostly under his breath. He then insisted that he had cleared the problem. We both knew he hadn't. Asking me how I had managed to let a man in Mumbai stick something in my ear he started syringing saline solution into my ear. I wasn't happy – I had lost my confidence. in him, he was now berating my misfortune and this spray-water-in-and-let-gravity-help-it-fall-out technique was not going to work. I told him as much and asked him to stop, removing the toe clip, expressing my displeasure. Agog, the doctor was lost for words – I imagine his patients are usually more reverent and trusting. I asked for the address of the ENT specialist and walked out of the theatre. He asked me to come into his office and he offered me a seat. I was definitely pissed off – but more so because he would not listen to me than anything he had done. Unprovoked, he started to defend his qualifications, saying that he had trained in Chicago and had treated many tourists. He said we were having a misunderstanding. I told him that I understood exactly what had happened: I had come looking for help and he had made it worse – I was now quite deaf in one ear – ten minutes beforehand I could hear. Could he understand that? He stayed silent but began to pen a letter. It was a referral to Dr Gupta, the ENT specialist. I felt like saying that that was a bit of a cop out – I am the one who decided I needed to go to him, not you! But I bit my tongue. He asked me to come back afterwards so he could improve and I said I would. Luckily the ENT hosptital was 100m up the same street. As I waited for Dr. Gupta MS (ENT) DOR (BOM), MB, FAIS, FICS, FICA (USA) the crazy thoughts that you have in these situations flashed before my mind's eye. Would I have to go to Delhi to get this sorted. Back home? I cursed the strange man in Mumbai who had caused this. And he did, in less than 5 minutes. That familiar sensation in the ear, an irrational concern that my brain would get sucked out during the procedure, but it was fine. My hearing came straight back. The doctor gave me an array of tablets and ear drops, all samples and then said that as a guest in his country I would receive the treatment free of charge. I was dumbfounded in gratitude – what a lovely man. “Enjoy your travels in India! Be careful!” he said as I left, thanking him profusely. “And keep your ears dry even when it's not raining!” I wouldn't have to make an emergency exit after all – I was delighted. The final chat with Dr. Raisoni was not that comfortable for eiter of us. He had brought a well dressed Indian lady with excellent English in to the meeting and it started with a defence of what he did, added to by the lady with references to the satisfied foreigners who had received treatment. She seemed lawyer-like somehow. I told him that I had been right, there was fungus in my ear (it seems the strange man was at least not the main culprit). Now it had been removed, I had the medicine I needed so I was happy. At that point he got a call – Dr. Gupta calling him back. They seemed to exchange a joke and the call finished. One more time Dr. Raisoni started to make excuses and call it a misunderstanding. Whatever he wanted to call it I didn't care. “You asked me to come back so you could improve”, I said. I asked him to be honest with his patients – all he needed to do was admit that he couldn't do it (and I did thank him for trying) and refer me to someone who could. I think his usual Indian patients would submit to his superior education while I am a bit more willing to follow my own understanding. We shook hands and parted not amicably but I hope with some greater understanding of each other. After a great dhal fry lunch I made a reservation for a ticket out of Jalgoan. I had planned to make for Indore and from there make for Mandu, a little backpacker town in the hills. The manager of the Plaza advised to go to Khandwa instead and take a direct train from there. With no reason not to believe him I got myself on the waiting list for a 6am train. After this I retired to the room, feeling a little alone. As if by magic one of my favourite feel good movies, Jerry Maguire was on HBO so I had a very chilled afternoon. The evening was spent eating even better vegetarian curry with some light internet and packing. I had enjoyed Jalgoan with it's laid back atmosphere and good food and hotel. And it had given me a solution to my ear problems which was the main goal. Time to move on!